The bioaccessibility of a compound is the quantity of that compound that is capable of being absorbed by the intestinal wall so that it arrives in the blood and is accumulated in the organs and tissues where they can effect their potential health benefits. The cold treatments have two opposing effects. On one hand, they cause the carotenoids to degrade (negative effect) and, on the other hand, they generate an increase in the bioaccessibility of the carotenoids (positive effect). Taking these two effects into account, it can be concluded that deep-frozen juices that are defrosted to room temperature or in a microwave are potentially better at increasing the level of carotenoids in the body. During this project, testing was done on fresh orange juice, on deep-frozen juice that had been defrosted to room temperature, either in a microwave or in the fridge, and on pasteurised juices. The analysis focused on two carotenoids in particular, phytoene and phytofluene, which are both colourless. "These compounds are increasingly acquiring importance among the scientific community as there are ever more studies that indicate their various benefits for health and cosmetics," says Paula Mapelli of the University of Seville. Although all the cold treatments analysed generated carotenoid loss, the deep-frozen juices that were defrosted to room temperature or in a microwave were better sources of bioaccessible carotenoids than fresh juice. "That is to say, despite the fact that the concentration of carotenoids in the deep-frozen juices was less than in the fresh juice, the reduction in the size of the particles and the destruction of the cellular material that these treatments produce mean that the amount of carotenoids that can be absorbed by the intestine is higher," the researcher adds. Regarding the conditions under which the natural properties of the juice are best preserved, the researchers say, "Fresh juice is the juice that has the highest concentration of carotenoids, but this does not mean that it is the one that raises the carotenoid level in the blood and tissue the most, as you have to take into account the amount of carotenoids that are actually absorbed." "Consumers tend to think that treated juices are 'less healthy' than fresh juices. However, in this study, it has been shown that, at least in relation to the content of carotenoids that reaches the blood and tissue, this is not always correct," says the University of Seville Faculty of Pharmacy teacher Antonio J. Meléndez. This research was carried out using the Pinalate variety of orange. This variety is a spontaneous mutation of the Navelate sweet orange. It is totally "natural," not transgenic. The most important characteristic of this variety is that it has a high concentration of the colourless carotenoids phytoene and phytofluene. "Our next step, which will complete this research, will be to determine the content of colourless carotenoids in the blood after consuming these and other orange juices. 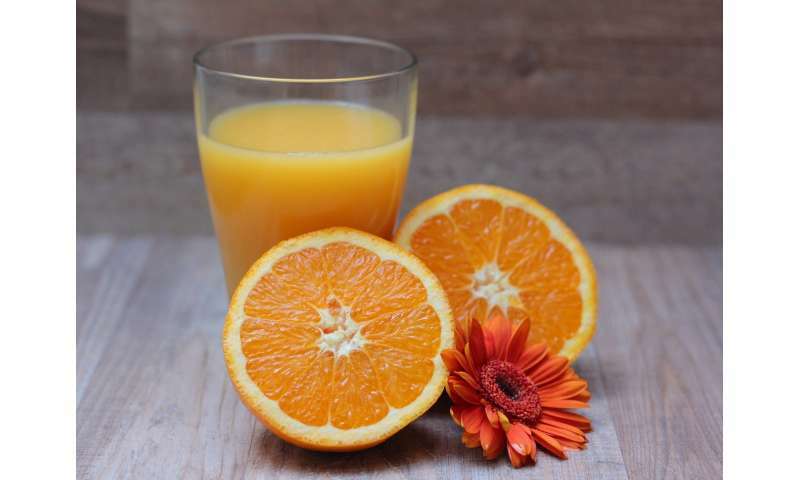 That is to say, an in vivo study that corroborates this and other previous in vitro studies with other orange juices," says the researcher Carla María Stinco, also author of the study.